Puppet show full of fantasy, not just for young spectators, accompanied by music of the Baroque and early Classicism. Monday 9 November 2015 8:30 & 10:15 — Theatre Polárka, Tučkova 34, 602 00 Brno, Czech Republic. Concession for children up to 15 years old, students up to 26 years, and others, see here. Family tickets are valid for 2 adults + max. 2 children, or for 1 adult + max. 3 children. School classes: Reservation required: E-mail or telephone +420 777 466 813. This music-educational puppet theater performance full of fantasy and accompanied by Baroque and early Classical music is intended for a young audience and their parents, and for school classes. It offers an hour of sparkling ideas and witty short sequences in the form of a puppet show that introduces child spectators into the world of music, fantasy and musical magic, without having to worry about its alleged inaccessibility. 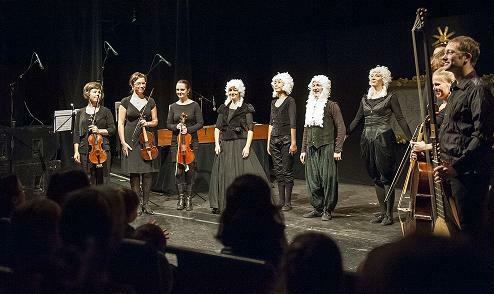 The premiere of Loutkando took place in October 2013 within the Strings of Autumn festival in the Minor Theatre […]. This venue with an estimated capacity of three hundred spectators was full of children – preschool and adolescents, happy and crying, embarrassed and courageous, – but mostly curious and inquisitive, as they swarmed onto the stage at the end, really wanting to see what pipes were hidden in the organ and how the keys of the harpsichord plucked the strings with the swan quills. Directed by Evgeny Ibragimov and “moderated” by Adam Viktora, who also jumped into the role of an organist, the members of Ensemble Inégal presented the musical instruments and their various sound possibilities to the children through the music of Bassani, Biber, Petrov, Pachelbel, Bach, Gastoldi and Zelenka, – and also the way the “musical language” is recorded in the sheet music. It was a truly charming “play with Baroque music” and the spontaneous reactions of the children testified that the staging was a smash hit for the “target audience”. This “lesson of music education” was given at a high professional level – no “cheating”, and also the adults had a good run for their money. Divadlo pod Šťastnou Hvězdou (Theatre under a Lucky Star) is a chamber troupe of puppeteers operating alternately in the Czech Republic, Russia, Estonia and Switzerland, which was created out of a desire to entertain themselves and others using puppets and other artistic skills. Under the expert guidance of the renowned theatre globetrotter, the Circassian director Evgeny Ibragimova, they create unique puppet shows for young spectators. Their international composition highlights the diversity of cultures. Ensemble Inégal with the artistic director Adam Viktora is a renowned musical ensemble operating on the Czech and international scene since the year 2000, mainly dedicated to Early Music and the legacy of the Czech Baroque composer Jan Dismas Zelenka. Its recordings have been awarded many times, it holds multiple Diapason d’Or prizes of the French music reviewers.